Development of the Shoppes at Sherwood—the proposed 18,000-square-foot retail strip center on South Sherwood Forest Boulevard—is in a holding pattern, with construction now estimated to begin by this summer. When plans for the strip center were unveiled some nine months ago, developers hoped to break ground in late 2018, with stores and restaurants opening in early 2019. But North Carolina-based owner/developer Tributary Land Design + Build would like for the center to be 70% to 80% pre-leased before starting construction, says Carmen Austin, a leasing agent with Saurage Rotenberg Commercial Real Estate. They’re also examining different options to determine what’s best for the property, she says. The property is currently listed at an annual lease rate of $22 to $25 per square foot. Meanwhile, the attached 10,375-square-foot space formerly home to Golden Corral for more than a decade is being listed both for lease ($13,401 base monthly rent) and for a reduced sale price ($1.8 million). So far, three prospective tenants have signed letters of intent for the space, so Austin plans to secure another three or four tenants before moving forward. 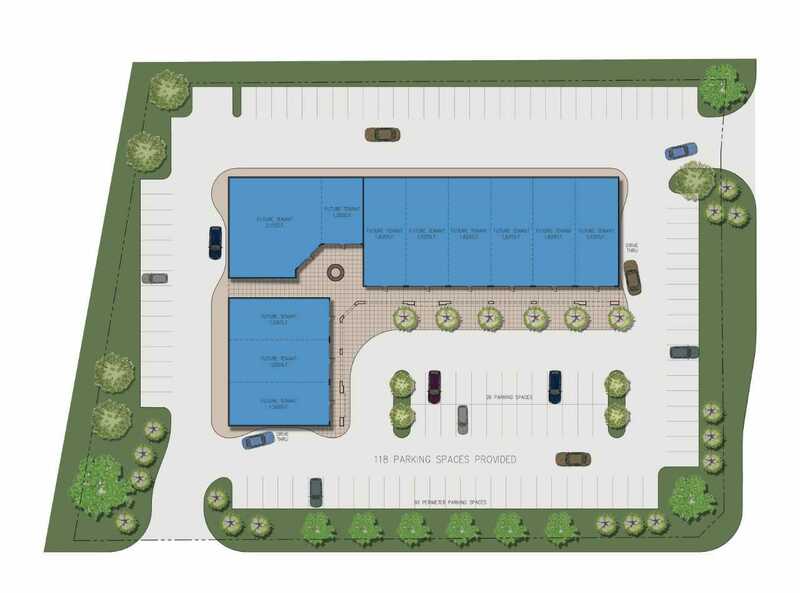 Under the current concept, the center, when complete, will accommodate up to 11 tenants, with drive-thrus available at a few spots, as well as 118 parking spaces. See renderings for the center.